The developers reimagining the former Arsenal Mall area as Arsenal Yards—a more curated, greener, mixed-use mall for the close-to-Cambridge suburb—have signed on the correct national burger chain for the new development: Shake Shack is opening next year in Watertown, Arsenal Yards announced today. Boylston Properties and the Wilder Companies are behind the Arsenal Yards project, which is slated for completion in 2020 and will span more than 1 million square feet in Watertown’s East End. In addition to upgrades to green spaces around Arsenal Park and access to the nearby Charles River bike path, the plans call for 250,000 square feet of “curated” retail and dining options, office space for creative and science-driven industries, and more than 400 new residences. It will have a Roche Brothers grocery store, a Hampton Inn and Suites, and a Majestic movie theater with a full bar. Shake Shack, which already has five Boston-area locations, is the fast-casual brand under Danny Meyer’s venerable Union Square Hospitality Group umbrella. The New York City restaurateur is the hospitality leader behind the likes of Eleven Madison Park and Gramercy Tavern. He founded Shake Shack in the early 2000s, applying USHG’s high-touch approach to ingredient sourcing and staffing to a classic fast-food model—pretty much establishing the still-growing trend of “fine-fast” dining. It now has 180 burger joints around the world from Chestnut Hill to Istanbul, but Shake Shack still attracts strong crowds hungry for all-natural Angus beef burgers, cage-free chicken sandwiches, hormone-free hot dogs, and all-natural frozen custards spun in-house. The Watertown location will have the full Shake Shake menu, plus the company’s typical location-specific custard, made in collaboration with other local food purveyors, which will benefit a local charity. Shake Shack is the second dining option announced for the development; City Works Eatery and Pour House, a casual, beer-focused restaurant with seven locations elsewhere the country, will bring its signature 90-draft bar to the ‘hood, too, the Boston Globe previously reported. 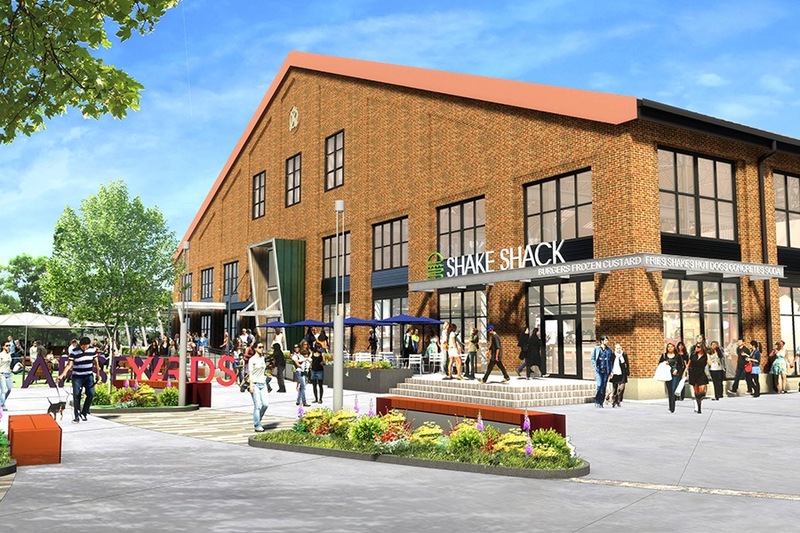 Shake Shack is on track to open near 485 Arsenal St. in Watertown in 2019.